Arrive KushokBakula airport Leh - 3500m above sea level. Transfer to hotel. Breakfast at the hotel before 09.30 am. Half Day at rest for acclimatization. After lunch Visit Shanti Stupa &Leh Palace, Later in the evening walk around local market. Dinner and overnight stay at the Hotel Leh. After breakfast, carry packed lunch for the day. 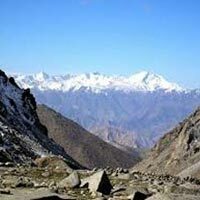 Indus &Zanskar river Sangam, drive along the Indus river visiting, Pathar Sahib Gurdwara and Magnetic Hill (where the cars defy gravity), and further on to Leh Hall of Fame (which has a museum of the Kargil War memorabilia). Over night at hotel. Nubra Valley and Hundur Sand Dunes –Drive 120 Kms 4/5hrs Khardungla is the World's highest motor able road at 18832 feet above sea level. At Khardungla pass the snow capped peaks and the mountain views are amazing. The road then passes through a bridge laid on Glacier which finds its way in Guinness Book of world records, Drive through the Valley which is extremely beautiful for photography. Nubra Valley is the Oasis of Ladakh as you see some colourful trees in this region. Later reach your camp visit the Sand Dunes if lucky you will get the sight of the Two Hump Bactrian camels, enjoy time at the Sand Dunes of Nubra valley spread across Hundur Village . Over Night at Nubra. After an early breakfast we leave for Pangong Lake through Changla pass 5486 Mtrs. Pangong Lake, situated at 14,000 feet (4,267 m). 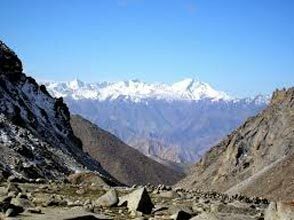 A long narrow basin of inland drainage, hardly six to seven kilometre at its widest point and over 130km long, it is bisected by the international border between India and China. A few years back the government decided to open it to tourists though the lake and its surrounding is under army surveillance. Enjoy the landscape in the back drop of the Lake. One rarely feels so close to nature and environment and the scenery is unforgettable. In evening enjoy walk around near the lake. Over night at Pangong. ,Drive back after breakfast Via same route. Tour of Hemis, ThikseyShey monastery & SindhuDarshan After a leisurely breakfast, we drive to visit Hemis Monastery situated 45km west of Leh; Hemis is the largest and the wealthiest monastery in Ladakh. From Hemis, you are driven back taking the same route to visit Thiksey Monastery, located on a hill-lock with formidable views of the Indus valley. Thiksey is especially noteworthy for its gigantic seated statue of the Maitreya and is also known for its (Dukhang) assembly hall which houses hundreds of rectangular prayer books, stacked between wooden covers and bound in silk. After that we continue to drive through series of chortens to visit Shey Palace the former summer palace of the King of Ladakh. Dinner and Over Night at the Hotel .